Bean bags with your beersies? Yeah, go on. You don’t have to be a local to recognise St John’s is perhaps the most popular spot down on the Wellington waterfront. With its elegant lofty ceilings, prime location and constant weekend vibe, St John’s dominates in its heritage building on Cable Street (which was the ambulance station back in the 30s). Name makes sense now, eh? 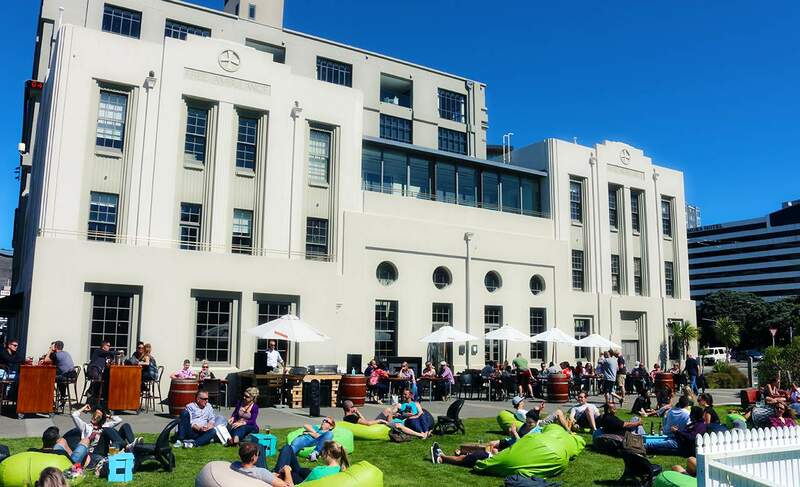 Alongside a sizeable, New Zealand-heavy wine list, St John’s has all the internationals on tap like Heineken, Tiger and Erdinger and often features guest tap beers from Monteith's and Wellington's Black Dog Brewery. Serving up your pub grub classics with a little more finesse than your usual tavern, the hotel's menu ranges from generous salads to hearty favourites. On a colder Wellington day, a perfect pick would be the braised lamb shank after a light start with the haloumi tartlette. While it’s near to impossible to go to St John’s without facing a bit of a bar queue, the punters are there for a reason: a top spot with good brews and great feeds. Too easy.